The process of spongeware was first popularized in the 19th century, most notably in Staffordshire in England's West Midlands. The high clay content around Staffordshire meant the area established some of the most famous potteries in history. Some of which included Wedgwood, Doulton, Minton (three of the potteries that showcased the most intricate and elaborate hand painted design). Spongeware almost rebelled against that formality. The process of spongeware is much simpler and requires less patience to create some really interesting results. For this reason it was sometimes known as a cheaper pottery, often glazed simply in blues or browns. While it went out of fashion for a while, the revival of spongeware is largely down to one woman; the British born Emma Bridgewater, who launched her spongeware ceramics business of the same name in 1985. The spongeware process is actually quite simple. You’ll just need to start with some bisque fired pottery (greenware) and a few different sponges. There are a few different varieties of sponge, which all produce different results. Silk sponges are natural sponges and are extremely absorbent, which makes them great for stippling and concentrated color work. Seawool sponges are a great alternative to silk sponges as they are also highly absorbent. If you’re looking for a man made sponge then a poly sponge is a good bet. Once you’ve picked out your sponge, you’ll need to make sure that the greenware is completely clean and wiped down with one of your damp sponges. If there are any places on your piece of ceramics you want to remain plain, then now is the time to cover them in wax resist. Pick the color glazes you want to use, pour a little of each onto a palette (or a ceramic tile), then get your sponge, which you can dampen a little if you like, and dip it into the color. Press it lightly onto your pot and then again before reloading the color (this will create lots of different shades of color on your ceramic ware). Once the first color has dried a little, you can load up a separate sponge with a different color and work into your first color. You can use as many colors as you like, but just a few shades tend to work best. 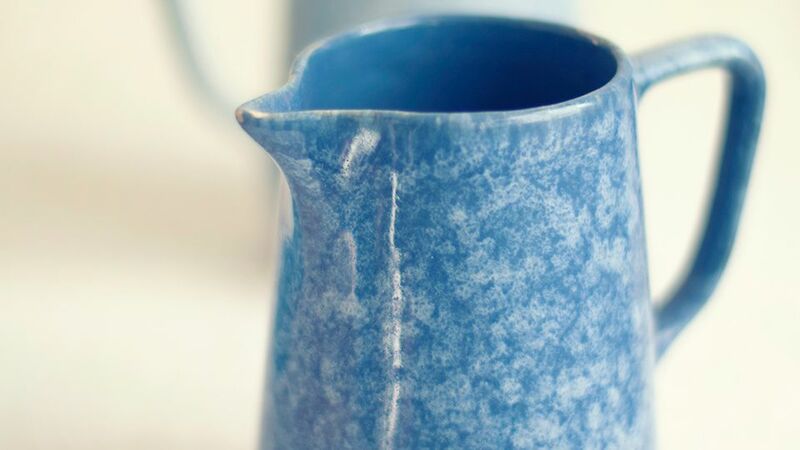 Some spongeware pieces have a solid color primary glaze and a different color for the sponged glaze. What Effects Can I Create With Spongeware? There’s a large number of different effects you can create with sponge ware, ranging from simple designs to something far more complex. Emma Bridgewater started her company with her famous simple polka dots and star patterned spongeware. In recent years, her designs have become much more elaborate. Times have changed the spongeware process slightly, and now ceramicists use cut sponges to create the intricate work. For example, Nicholas Mosse pottery has created a new lawn pattern, which takes over 2,000 prints of a leaf-shaped sponge on each bowl. You can buy ready-cut sponges or you can cut your own. The first thing you'll need to do when making your own sponges is to determine the kind of shape you want to create. Then you'll need to turn that shape into a template, draw it on something like acetate and place the drawn pattern onto your new piece of sponge. Cutting it out is the tricky part and some potters use something like a soldering iron, so they can cut around the shape very precisely. The soldering iron should cut right through the sponge and in any cases that it hasn't, you can use a pair of scissors to really sharpen up the edges.